Q: When is the Raven Rocks Run? A: It will be held Sunday, November 12, 2017 at 9am starting from the Meadow field at Ward Pound Ridge Reservation. Parking will be at the large Meadow Parking lot (and on the field as needed). Q: What is the registration cost for Raven Rocks? A: The cost is $40 plus a processing fee charged by RunSignup. Q: Can I register for Raven Rocks the day of the race? A: Yes, we will have same day registration, but cost will be $45 on race day rather than $40 if you register online. Race day registration will be from 7:30 – 8:45am. Cash or check accepted – due to unreliable cell connections, we cannot process credit cards on site. Q: Wait, wasn’t this race called The Fire Tower 10k? What happened? A: Yes, the original name we called the race was The Fire Tower 10k. It may even still appear in a few places on this website and related articles. It is the same course and organization. We changed the name since the county believed by calling it the Fire Tower 10k it might be misunderstood to mean that they have given approval for the rebuilding of the fire tower — which they have not (hopefully soon!). We wanted to hold a race starting in 2015 and we were able to make that happen by changing the name to Raven Rocks Run. Since one of the main course features is the Raven Rocks overlook (at just about the halfway point of the race), we really like this name. Plus we get to put ravens on everything and make endless Edgar Allen Poe references, much to the dismay of our kids. Q: Does this race pass the fire tower at the park? Photo circa 1972 of the Cross River Mountain Fire Tower – the tower is no longer at this site. A: The course runs by the location the fire tower formerly occupied. The fire tower is no longer there since it was dismantled in 1982. A group of enthusiastic Fire Tower “Wardens” are interested in restoring the fire tower to its former location at Ward Pound Ridge Reservation. We would like to raise funds and increase visibility for the fire tower project. The race also happens to be on a fantastic trail with a challenging trail loop to the two highest points in the park. Q: Are there any water crossings on the course? A: No water crossings on this 10k course. Depending on weather conditions before or during the race, parts of the trail may be wet or muddy so bring a change of shoes and socks at the very least. There are no river crossings like at the Leatherman’s Loop. This may be a good thing since the race is in November and temperatures can get pretty cold that time of year. Q: What is the course like? What exactly do you mean by “Hills and Thrills”? A: This is a tough 10k course. The elevation changes are comparable to the Sarah Bishop Bushwhack 10k course if you are familiar with that excellent trail race. The first half of the course generally ascends to the Raven Rocks Overlook. Then it descends quickly to turn around and get ready to climb the up the Fire Tower (blue) trail. There is one stretch where nobody will be running since it is a trail up a rock scramble near the summit of the Fire Tower Hill. That is a pretty short section though. The rest of the run is a mix of single and double track with most (95%) of the course beneath the trees and the whole course — with the exception of crossing Reservation Road — exclusively on trails. Q: What is the Raven Rocks Run raising money for? A: One of our aims is the restoration of the Cross River Mountain Fire Tower at Ward Pound Ridge Reservation. We have donated proceeds from the race to this end and will also donate some of the proceeds to the Lewisboro Volunteer Ambulance Corps. The LVAC organization and members have been on hand for the Leatherman’s Loop for decades and will be there manning a first aid station at the Raven Rocks Run. A: No, we do not have finisher medals for all runners. Prizes are yummy pies for winners and age group winners. Q: This is the last Trail Mix Series race for the year, is there an award ceremony for Trail Mix overall and category winners? For runners in The Trail Mix Trail Series who have completed the series we will have a social event (indoors) to recognize your achievement. For the overall and category winners, we will have further recognition. Date/time and location for the event TBD. Make sure you are on the Trail Mix email list so you get notified of the event details. A: We will award prizes in the tradition of the prizes for the Leatherman’s Loop. A prize for 1st, 2nd, and 3rd overall male and female. Then age category 1-2-3 prizes for Juniors (19 & under), 20-29, 30-39, 40-49, 50-59. 60-69, 70-79. and 80+. Q: Will there be a $10 per car parking fee like on other days I enter Ward Pound Ridge Reservation? A: We have already built the parking fee into the cost of your race registration. A county employee will be counting the number of cars entering for the race and they will give us a parking bill based on that number times the parking rate. This means if you can carpool with another runner or two we will have more money left after the race to donate to the Trailside Museum! A: No. Registrations are non-refundable and non-transferable (that means no resale of bibs). We don’t do deferrals. (excerpt from Leatherman’s Loop FAQ page below). Our all-volunteer organization does not have time for a rush of transfers and deferrals in the weeks before the race. People still ask, and the answer is no. If you are reading this, thanks for not asking and we are very sorry we can’t accommodate you. Q: Will the race be cancelled in case of rain, snow, sleet, volcanic activity, etc? A: Generally, no — the race will go on regardless of weather. The only exception would be potentially dangerous conditions like thunderstorms or icy hazards occurring during race time. If these conditions exist it will be a joint decision of the race director and the park whether the race occurs. If a cancellation occurs there will be no refunds for the race fees. By registering you take on the slight risk of the event not happening. For this type of event much of the costs are sunk into the race prior to the race day and will not be able to be recovered. Money left after expenses will be donated to the Friends of Trailside Museum and Ward Pound Ridge as well as other local not-for-profits. 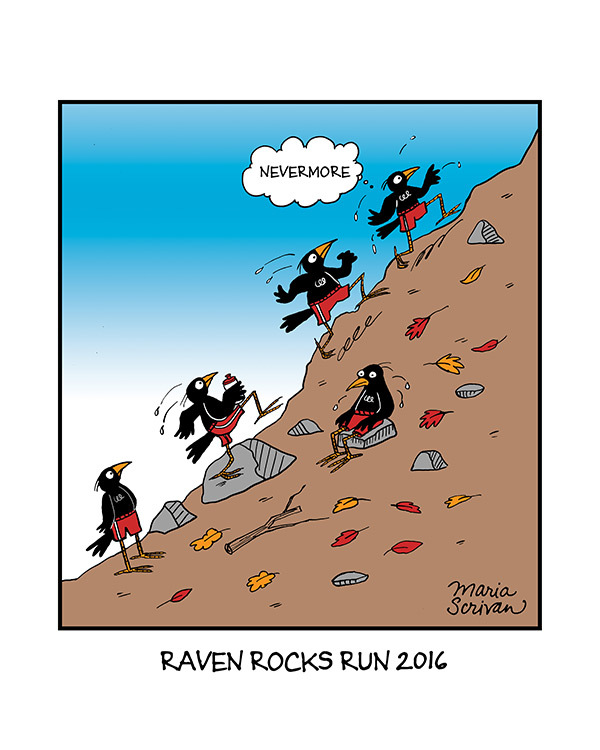 Q: Do I need to be a participant in the Trail Mix Trail Series to register for the Raven Rocks Run? A: No. The race is open to any who want to try their skill, speed, and endurance. The race is the sixth and final race in the Trail Mix series but only a percentage of runners are running it as part of the series. Q: Why is there a separate cost for the shirt? A: For many races the shirts are underwritten by sponsors whose names appear on the shirts. Our race has no sponsors other than the runners who run in it. This lets our Raven Rocks Run shirts be ad free. They are unique for each year of the race. If you run in a lot of races you probably have a ton of race shirts, but few will be like this one. Race income after expenses are donated to organizations supporting the restoration of the Cross River Mountain Fire tower and the park. The price of the shirt covers the cost of the shirt plus the commission of the artist who created the artwork — which has been an original creation created each year. The shirts are high quality long sleeved cotton. 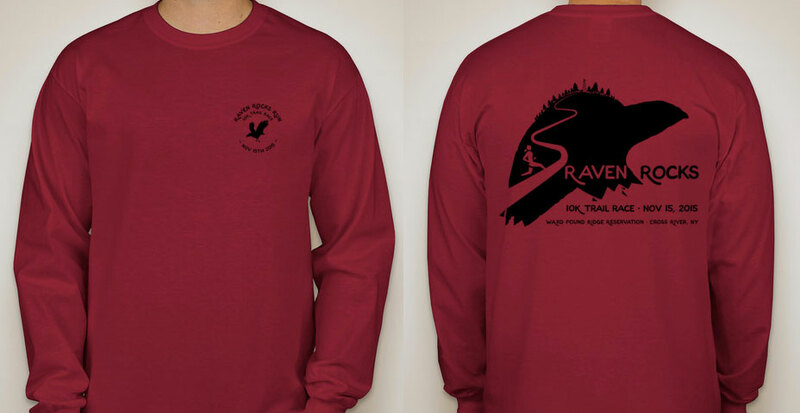 We think the Raven Rocks Run shirts are amazing but we don’t want you to get one unless you want it.